12 “If a man has a hundred sheep and one of them wanders away, what will he do? Won’t he leave the ninety-nine others on the hills and go out to search for the one that is lost? 13 And if he finds it, I tell you the truth, he will rejoice over it more than over the ninety-nine that didn’t wander away! 14 In the same way, it is not my heavenly Father’s will that even one of these little ones should perish”. 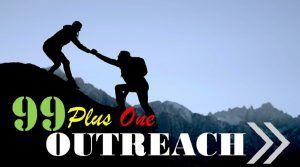 Join the Team in sharing the gospel by doing outreach and dropping leaflets through letterbox in houses around the local area.